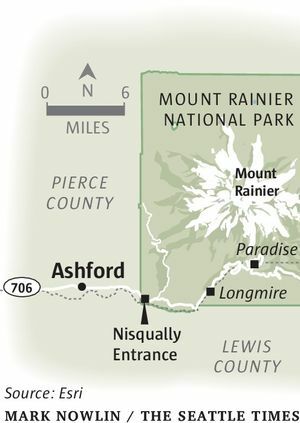 Along the road to Paradise, Ashford has scores of rustic rentals on the edge of Mount Rainier National Park. Many have a hot tub out back. 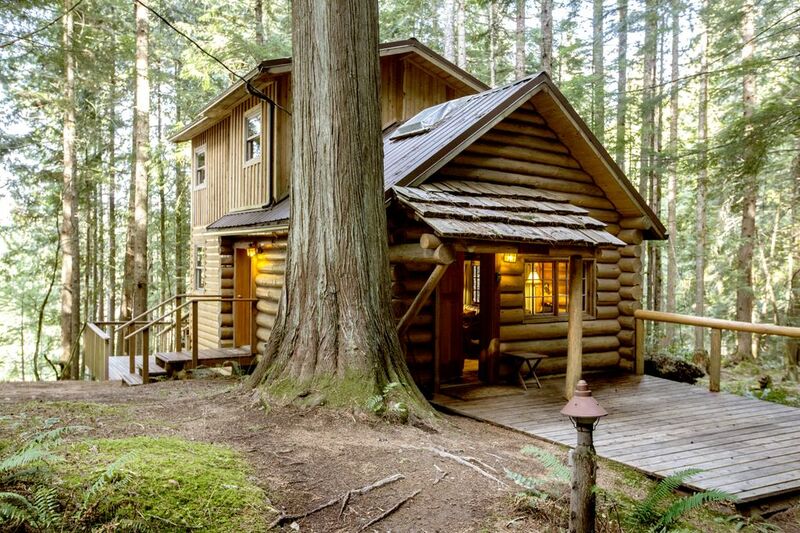 Editor’s note, November 2015: First published in spring, this story about cabin rentals near Mount Rainier National Park is of equal interest in winter, when the area is a magnet for snowshoers and visitors to the snow-play hill at Paradise. When you need a back-to-earth experience to help you forget Seattle traffic, few places suit the purpose better than Mount Rainier National Park. The only prescription better than a day of hiking uphill and down through subalpine woods and meadows? End that day at a cabin with a hot tub. Toward that end, the community of Ashford, just outside the park’s Nisqually entrance, is ready to serve. 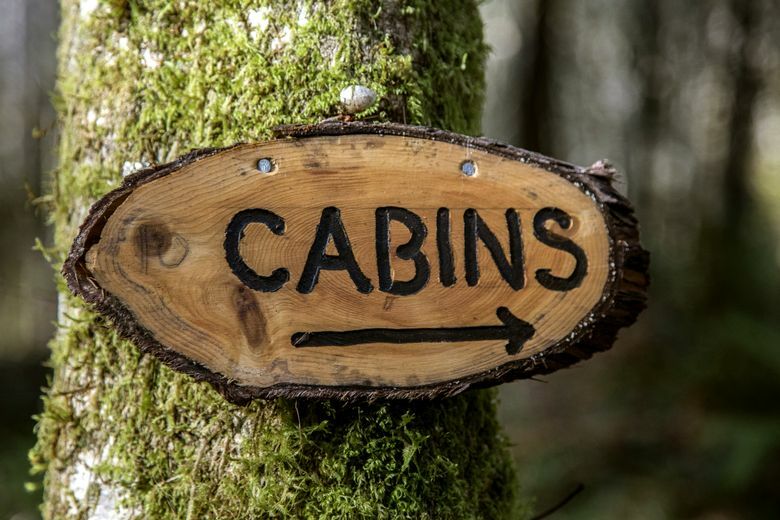 Just off Highway 706 are scores of nightly cabin rentals, from historic log cabins, perfect for a couple, to creekside lodges that could handle a family reunion. And at the choicest spots, hot tubs are standard. Gaze upward from your personal bubbling caldron to find your favorite constellation on a starry spring night. 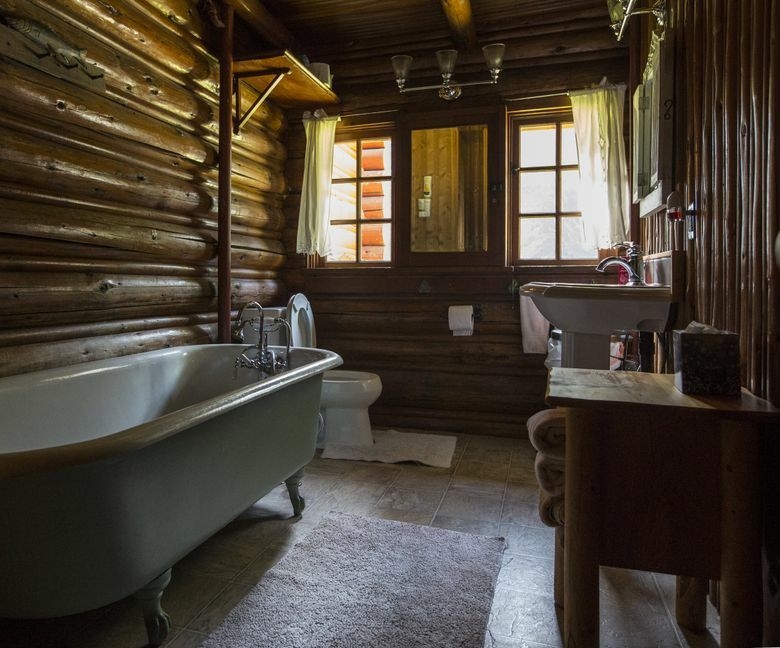 Looking for an authentic log-cabin experience? 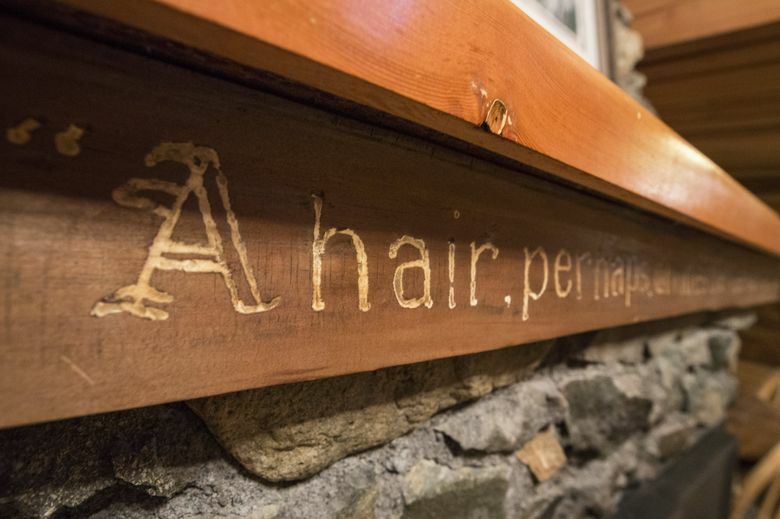 The 1955-vintage, one-room Copper Creek Log Cabin, next to the Copper Creek Inn restaurant, filled that bill for me like a fat marmot fills its fur. John Baptiste (“Babs”) Cote, a legendary log-wrangler who erected dozens of cabins around Ashford in his day, built it. A yellowing newspaper clipping on the cabin’s wall tells of his reputation as a rough and ready pioneer. It’s just yards off the highway but screened by ferns and cedars. Windows look out at moss-fringed trees that would do the Hoh rain forest proud. 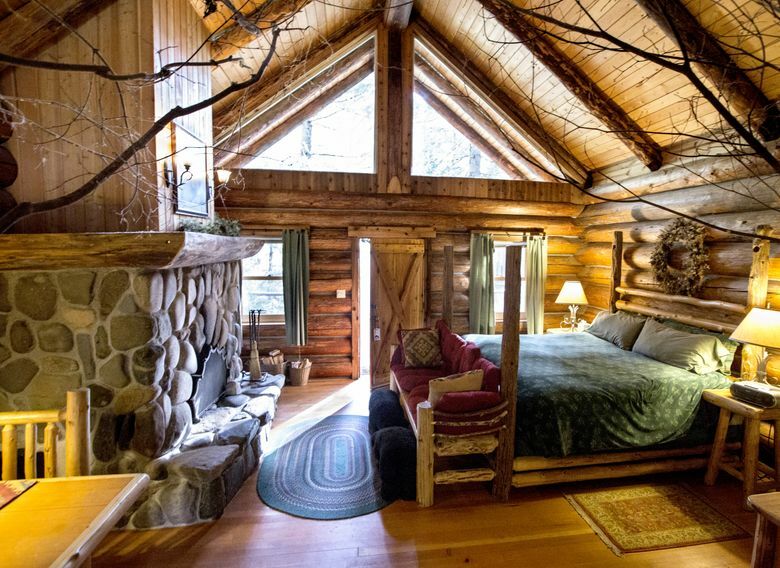 A wall formed by the gas-fired fireplace and its chimney — built of field rock and petrified wood — provides a private nook for a queen-size bed. Out back are a two-person hot tub and your own gas grill. Need to stretch out? Just across chattering Copper Creek is the Copper Creek Lodge, rented out by the same hosts. 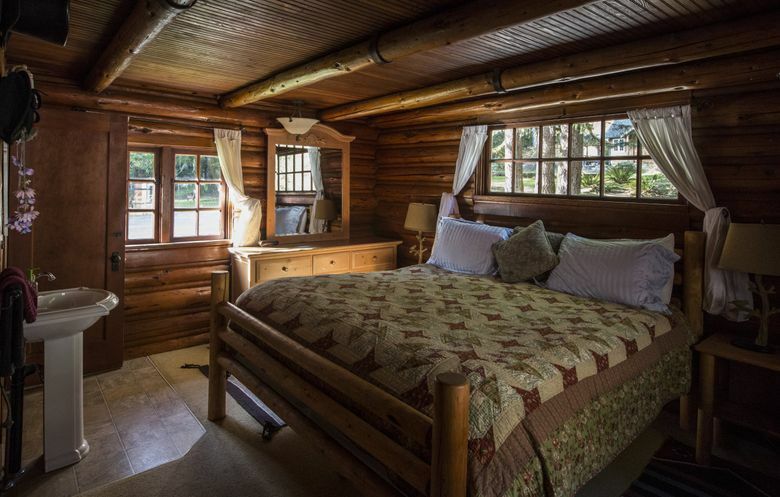 Built of logs in 1915, it sleeps 12. Over the river-rock fireplace, the whimsically carved head of a longhorn steer looks down from the gleaming wood mantel, like you’re in a Frederic Remington painting. 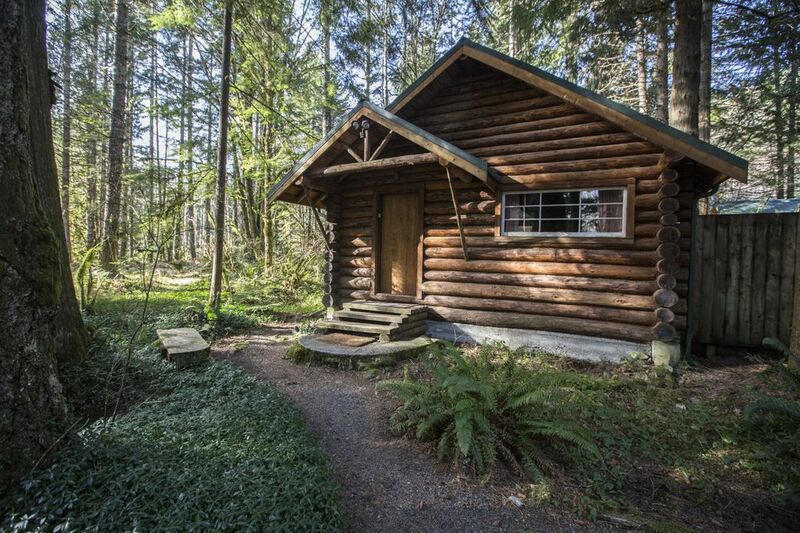 Details: 10 cabins for rent, most within two miles of the park’s Nisqually entrance, most with hot tubs. Mid-April weekend rentals $119-$295; rates vary by season and day of week. 360-569-2799 or coppercreekinn.com. 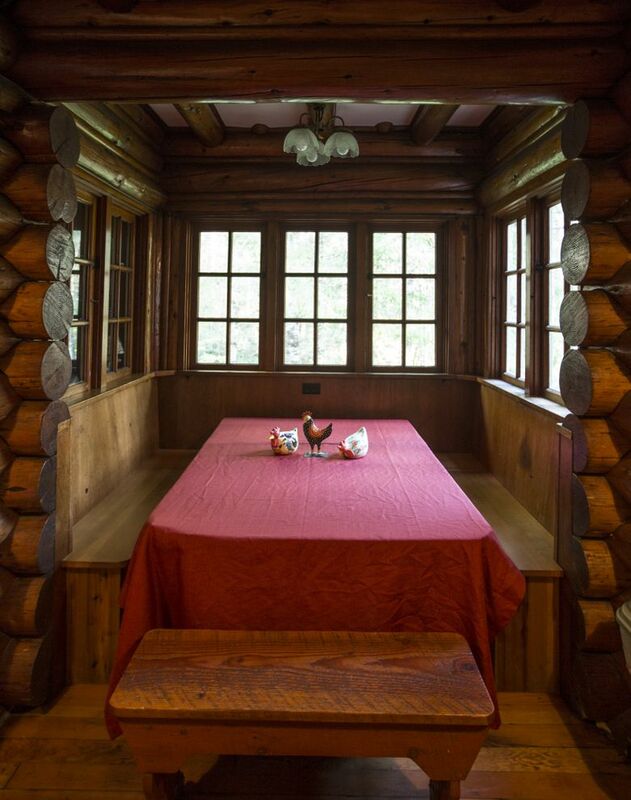 Back in the 1940s, busy “Babs” Cote also built the Mountain Home Log Cabin in this complex of five cabins up a private, wooded lane on 20 acres abutting the national park. Otherwise, much of the interior is sleekly renovated. Hardwood floors gleam below an arching balustrade edging a sleeping loft reached by a spiral staircase. A cozy dining nook looks out on a steep hillside of thick trees and a deck with a hot tub high above the highway. 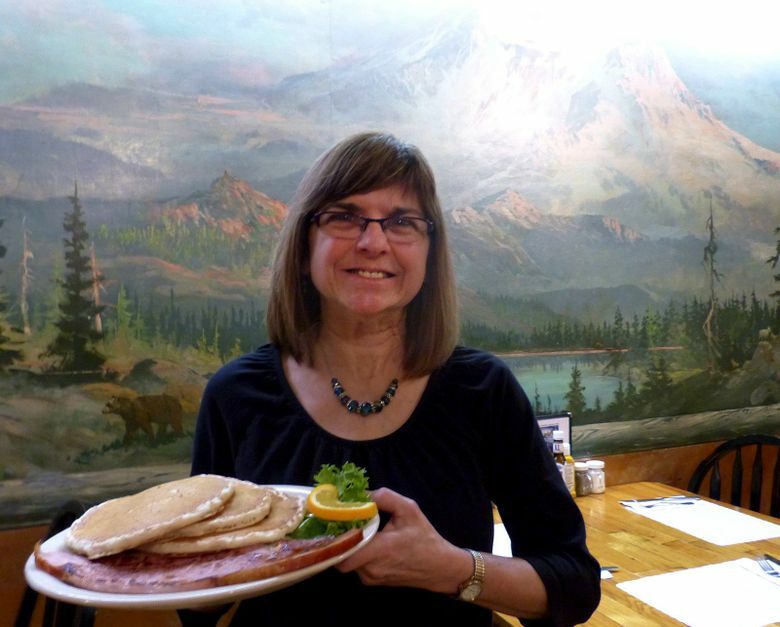 “My grandfather rented cabins here for $1 a night in the 1930s and 1940s,” recalls Liddle, who grew up on Mercer Island but spent many a holiday at her grandfather’s cabin and fell in love with Mount Rainier. “We’re on a cliff and the park is right there,” she says, pointing out a window. Details: Five hillside cabins for rent just outside the national park, most with hot tubs; also two Nisqually Valley cottages. $110-$275, with weekday discounts October-April. Two-night minimum stay on weekends, holidays and nightly from June through September. 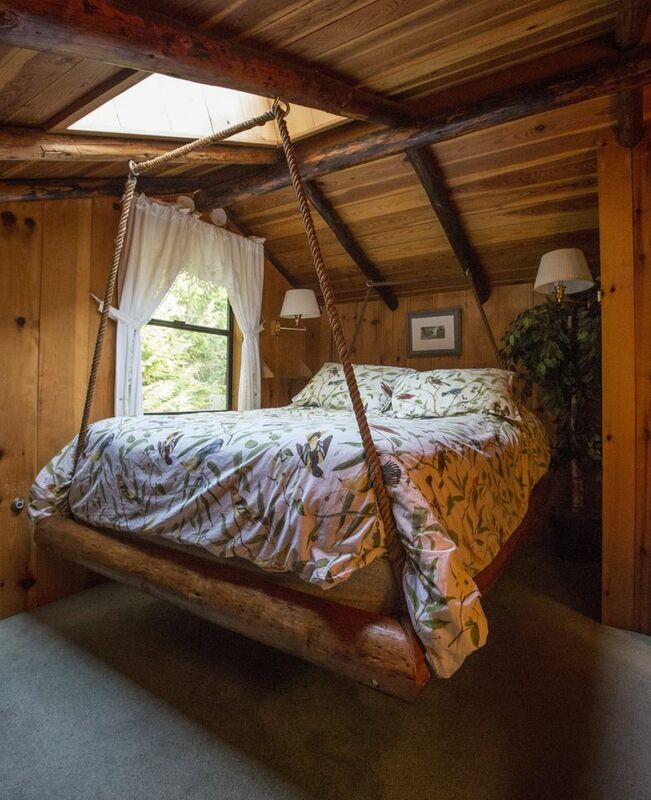 866-553-9373 or deepforestcabins.com. 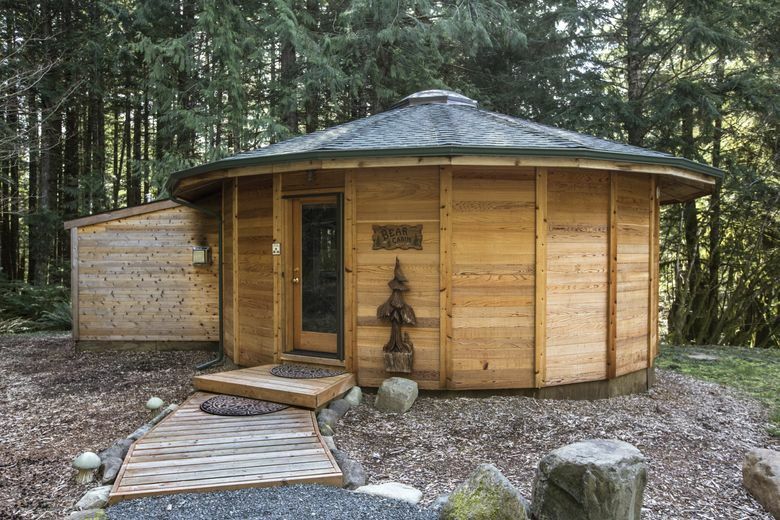 Here’s a place for a massage and a romantic weekend with your honey at cozy, circular, yurt-like cabins with amenities such as custom-built peeled-log beds, two-person showers, and hot tubs outside the door. About 1,000 free movies are available on an in-house video system. 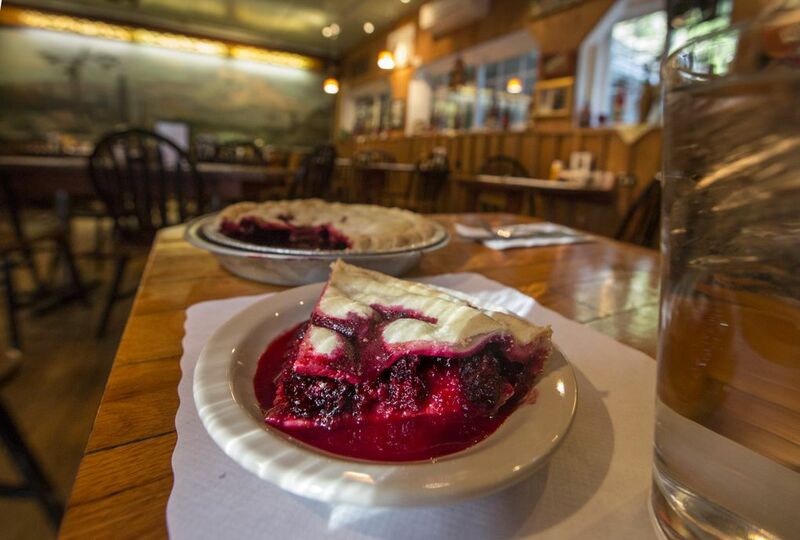 “Sometimes we don’t see people come out of their cabin all weekend,” confides Stormking co-owner Deborah Sample. 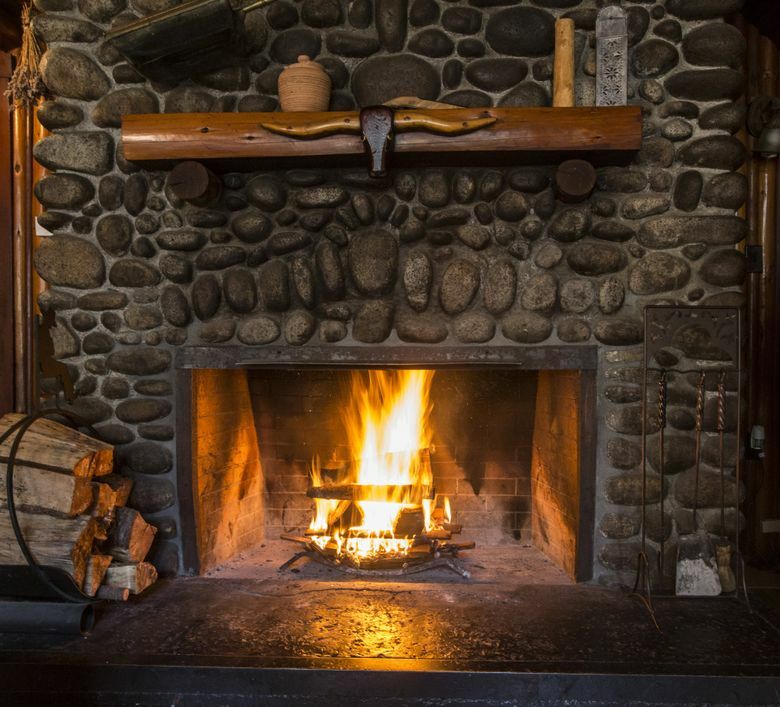 You can use one of the small charcoal grills to barbecue a steak, but you don’t get a full kitchen here, so you might want to plan a few meals at the Copper Creek Inn or a picnic on the mountain. The jar labeled “Deer treats” outside your door tells you who the neighbors are. The grounds here are more customized than some; look for the hollowed-out log with stream water from Goat Creek flowing through it. A new greenhouse is going up soon, to grow flowers and offer guests a warm place to relax in cold months. Details: Four cedar-sided, circular cabins on grounds adjacent to the office, 1.5 miles from the park entrance; a fifth, the Eagle Cabin (rectangular), is a short drive away. Year-round rates: $205-$230, with two-night minimum stay. 360-569-2964 or stormkingspa.com. Wellspring is more a spiritual retreat than a cabin resort. Owner Sunny Thompson waited years to create a website, claiming she was waiting for a “. calm” extension instead of “.com” for her URL. Park in a central lot after unloading your stuff and walk back and forth to your log cabin in the woods. Or your “camping cabin.” Or your treehouse (they have one). There’s even a guest room with its own Zen garden. Two outdoor cedar hot tubs are privately reserved by the hour ($10 per guest). Massages and saunas are available. One of my favorites is the Tioga log cabin, with a peeled-log ladder leading to a loft with a hammock. Real tree branches seemingly sprout from the loft’s rail. 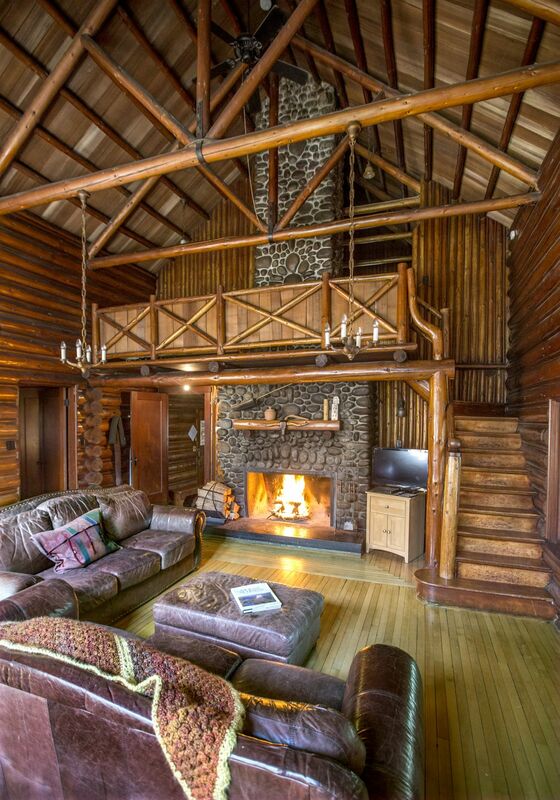 Two plush black bears — the stuffed kind — serve as footrests for the sofa in front of a massive river-rock fireplace, not far from the indoor Jacuzzi tub for two. 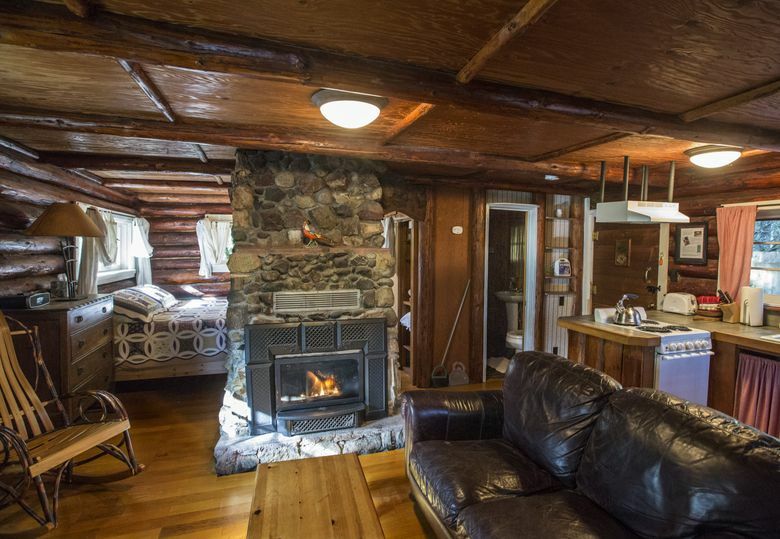 Details: Six log cabins, plus a lodge and a variety of other rentals, well off the highway. 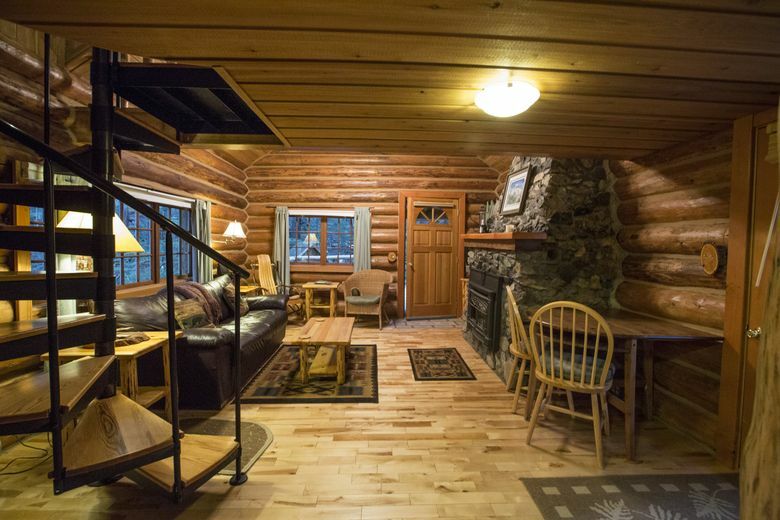 Year-round rates: $95-$195, or $575 for the lodge. Visit in each of the four seasons and the fourth season’s visit is free. No phone. Email info@wellspringspa.com or see wellspringspa.com. There’s plenty to do in Mount Rainier National Park (nps.gov/mora). A moderate, lower-elevation day hike is from Longmire to Carter Falls and Madcap Falls on the Paradise River (7.2 miles round trip). 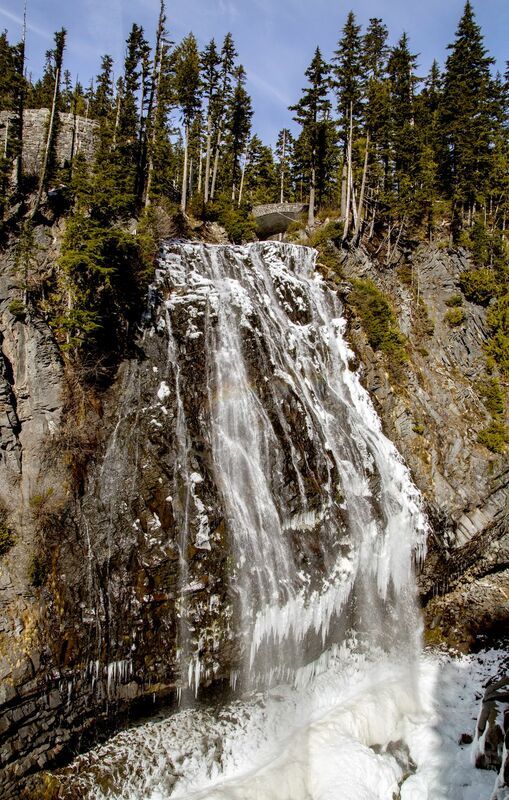 Or see popular Narada Falls, reached via a short paved walkway from a parking area six miles uphill from Cougar Rock Campground, along the road to Paradise. Check at Longmire Museum or ask the ranger at the Nisqually entrance for other day-trip ideas ($15 per vehicle park admission; free weekend, April 18-19). Dogs are not allowed on trails in the national park, nor are they allowed in most cabins. Of those listed here, only the Cedar Springs cabin rented by Copper Creek Inn allows pets; $25/night fee.